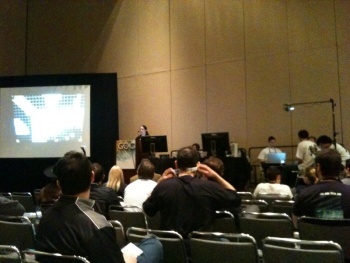 Kattan-Wright (center) speaking at GDC while the rest of the team (right) demonstrate playing D&D on the Surface. "We use Surface to enrich the D&D experience," says Dyala Kattan-Wright, the spokesperson for the group, who says Surface was an obvious choice for D&D-related development "because of its form factor: the table." Players of pen and paper role-playing games, like D&D have long sought to employ the power of computing technology to smooth over some of the hobby's rough edges, such an abundance of rule-heavy literature and sometimes tedious accounting and combat mechanics. Attempts to merge paper gaming with computers vary in both their manner and effectiveness, but with their Surface application, the Carnegie Mellon team thinks what they've managed to accomplish is the first and best true marriage between the two. "Surface allows us to automate some of the complexity of D&D," says Kattan-Wright, but unlike previous D&D computer programs, preserves what players find most unique about the experience: the tactile control of miniatures and dice rolling, and the social aspect of playing a game at a table with friends. The Surface device's ability to recognize objects allows the players to register their character miniatures with the program, which will afterward recognize the presence of that character wherever their miniature is placed. Players can then cast spells and manage their character's abilities and inventories through use of a radial menu orbiting around the base of their miniature, and the program will even keep track of line-of-sight, spell effects and damage, making the game an almost seamless narrative experience. The Dungeon master controls the game and can view secret information away from the eyes of the players by use of a networked laptop, and can display suggestive imagery and dungeon maps directly on the surface of the Surface, allowing players to interact directly with the game in real time. The effect is akin to a marriage between a standard RPG game map pad and a holodeck. Kattan-Wright says the automation "allows players to focus on what's really important about D&D - the narrative." And lowers the "barrier to entry" for newcomers. The team developed their program over the course of two semesters at Carnegie Mellon using Microsoft's XNA development tools. They're currently planning a larger scale demonstration at PAX East in Boston later this month. A video demonstration of the program in action and further details on how it works are to be had here.